Irish household incomes are rising strongly, driven by robust employment growth, and that would normally support the demand for mortgages, particularly against a backdrop of rising property values and low interest rates . Indeed,Irish financial institutions have seen new mortgage lending rise year on year since 2013, albeit at an erratic pace, reaching €7.3bn in 2017 from under €2.5bn four years earlier. The number of new mortgages drawn down annually for house purchase rose from 13,000 to over 29,000 over that period.The strength of new lending also began to offset mortgage redemptions a year ago and the annual change in net mortgage lending has picked up since, to 1% in September. The market has had to adapt to constraints on new mortgage lending, introduced by the Central Bank in 2015, including a number of changes to the controls, most notably from the beginning of this year, with FTB lending allowed in excess of the 3.5 LTI limit reduced to 20% from the 25% observed in 2017. The constraint applies to lending over the calendar year as opposed to approvals, and the latter may not translate into actual drawdowns for a number of reasons. Banks have therefore become much more cautious on approvals, paricularly to FTB’s, and approvals to that segment have been falling on an annual basis since March, declining by an annual 3.3% in the three months to September. In fact approvals to all borrowers for house purchase is also down relative to last year, at 9,741 in q3 against 9,876 in the same quarter of 2017. The relationship between approvals and drawdowns can vary a lot from quarter to quarter and actual lending for house purchase in q3 was stronger than the approvals trend implied, albeit still confirming a slowdown in the pace of new lending. Over 8,700 loans for house purchase were drawn down in the third quarter, 8% up on the previous year but compared with annual growth of 9.4% in the first six months, itself about half the pace seen in 2017. The value of lending for house purchase is also slowing, emerging at €2bn in q3, up an annual 11% against 16.5% growth in H1. The implication is that the average new mortgage is also increasing, as one would expect given rising house prices, but again there is a noteworthy change; the average mortgage for house purchase in the third quarter was €228,000, just 3% up on the previous year. Central Bank research indicated that mortgage controls would dampen mortgage lending and house building while also impacting house prices and that certainly seems to be playing out, although the possible effect on prices is being offset to some degree by the scale of non-mortgage buying, which still appears to be running at about 50% of transactions. One other striking feature of the mortgage market is the strength of re-mortgaging, such that lending for house purchase has fallen to 80% of total mortgage lending, from 94% three year ago. Finally, we have trimmed our estimates for new mortgage lending for 2018 as a whole, with €8.2bn now envisaged, including €6.8bn for house purchase. The number of loans for the latter is projected to be just over 30,000 from 29,400 last year. House price inflation in Dublin is slowing according to the recent CSO data; values rose by just 0.9% in the three months to May and actually fell in South Dublin, by 1.0%. An increase in supply is widely expected to dampen price pressures but new house sales year to date in the Capital are marginally down on the same period last year, as are total transactions, so demand factors may be playing a part. London and Dublin prices have been highly correlated in recent years and the price falls seen in the former may be having an impact on investor interest in the Dublin market. For buyers with Irish mortgages the latest data from the BPFI, on approvals and drawdowns, indicates that the recent tightening of mortgage controls is impacting and that affordability is becoming more important as a constraining factor. Mortgage approvals for house purchase fell by an annual 4.6% in June and rose marginally in the second quarter as a whole ( by 0.8%) . FTB approvals fell in q2, however, by 0.8%, and have been weak since the the first few months of the year; 10,882 mortgages were approved for first time buyers in the first half of 2018, against over 11,000 in the same period last year. 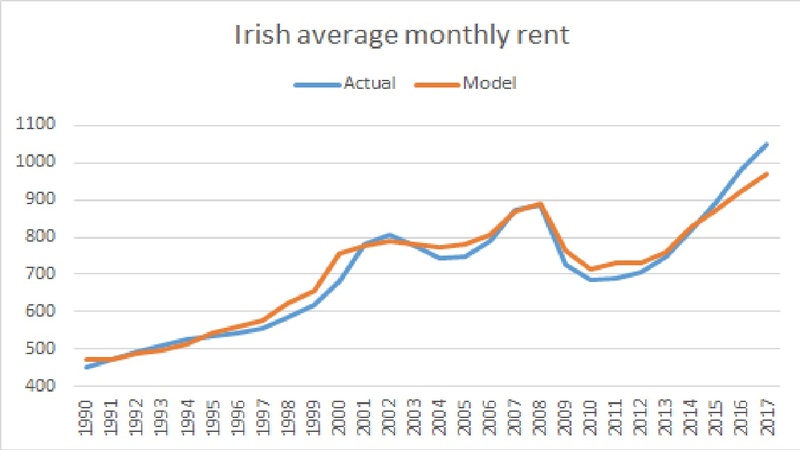 A quarter of mortgage loans to FTB’s exceeded the 3.5 LTI limit last year and the permitted excess was reduced to 20% in 2018, so one might expect that to dampen lending for house purchase, particularly as affordability ( the annual payment on a new mortgage relative to income) has deteriorated given the rise in house prices and associated increase in the value of an average new mortgage. Indeed, it is noteworthy that the average new mortgage for house purchase in q2 of €225,500 was broadly unchanged on q1 and 5% higher than a year earlier, as against a 9% increase in 2017. The number of mortgages for house purchase actually drawn down in q2 amounted to 7,381 or 9.2% above the same period in 2017, a slower pace of growth than the 9.6% increase in q1 and the 14.7% recorded in q4 last year. The value figure was €1.7bn, up an annual 14.7%, against an 18.5% annual rise in q1. The growth in total mortgage lending ( i.e including top-ups and re-mortgaging/ switching) was unchanged at 22%, however, amounting to €2bn in q2 , driven by a doubling of re-mortgaging/ switching over the year. Indeed, the latter amounts to 14% of total loans in q2 and one in five mortgage loans are now not for house purchase, the highest share since 2011. In sum, the growth in mortgage lending for house purchase is slowing, and the average new mortgage is also growing at a more modest pace , with FTBs squeezed by affordability and tighter mortgage controls. The steady stream of lower mortgage rate announcements indicates banks are responding, and that competition is more intense in re-mortgaging and switching. 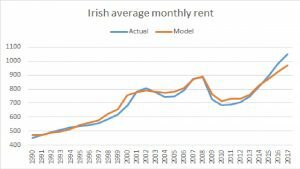 Posted on July 25, 2018 Categories Mortgage Lending, Property marketsTags Irish mortgage lending q2 2018, mortgage approvals, mortgage controls, re-mortgaging/switching. New supply data implies housebuilding consensus may be too optimistic. Annual house price inflation accelerated to 13% in April, the strongest pace for three years, bringing the increase from the cycle low to 76%, albeit still leaving prices nationally some 20% below the previous peak. Credit does not appear to have played a significant role in this recovery, at least to date ( net mortgage lending has only recently stopped falling and new lending appears to account for only half of transactions) and analysts have emphasisied more fundamental factors on the demand and supply side of the housing market. In that model housing demand has exceeded supply for some time now with the implication that prices will continue to rise ( absent a shock to employment or a steep rise in interest rates) until housing supply has picked up to a level which brings balance to the market. Supply, as in new housing completions, is picking up from historically low levels and in time is generally expected to approach and then meet estimates of annual housing demand. For example, the ESRI expect completions to exceed 23,000 this year and to reach 37,000 by 2020. That expectation was based on completions data from ESB connections which put the annual figure at over 19,000 last year, although some thought that overstated the actual flow of new properties. Fortunately, the CSO has now started to publish completion figures on a quarterly basis, based on a range of sources , and they imply that completions may be much lower than generally expected over the next few years. The new figures, dating back to the first quarter of 2011, show completions of 57,000 over the past seven years, against an ESB total of over 90,000, a difference of 33,000. Last year’s total is now put at under 14,500, or 5,000 less than the ESB figure, and for this year the CSO figure for q1 is 3,500. The latter may have been adversely affected by the weather but a full year figure of 17,000 or so seems much more likely than anything approaching 25,000. The implication is that the housing stock has been growing at a slower pace than previously thought and that the stock per head of population , a key variable in many demand/supply models, is still falling ( it started to decline in 2011) and will continue to decline for the next few years. Indeed, new population projections by the CSO highlight that demographic pressures will remain a feature of the Irish market; the population is projected to grow by over 300,000 by 2021 on a high net migration scenario or by 1.3% per annum, against a housing stock still growing by well under 1%. The CSO’s Residential Property Price index for March showed prices still accelerating nationally, with the annual change at 12.7% from a downwardly revised 12.5% in February and 12.1% at the end of 2017. Property price inflation in the capital slowed, to 12.1% from 12.6% the previous month, but picked up strongly over the rest of the country, to 13.4% from 12.3% . Prices were particularly strong in the mid-West (Clare, Limerick and Tipperary), rising by an annual 16.4% but fell for the second consecutive month in the Border counties, reducing the annual gain to 8.8%. Within Dublin, house prices in the city rose by an annual 14.2%, with South Dublin lagging, showing a rise of 9.6%. The housing market is generally perceived as characterised by chronic excess demand although the exact amount of new supply (house completions) is subject to some doubt. The number of housing transactions is available though, through the CSO, and the figure for the first quarter is actually down on the previous year, at 13,967 versus 14,500. The decline in turnover was particularly acute in Dublin, with transactions down 10% to 4,500. The number of mortgages drawn down for house purchase in q1 , at 6,400 , was up by some 10% on the previous year, but that still implies that over half the transactions in the quarter (54%) were financed by non-mortgage buyers, a persistent feature of the market. First time buyers account for more than half of loans but are clearly competing against investors, both corporate and individuals, as well as each other, for the limited supply available. Moreover, the approvals data, a leading indicator of drawdowns, indicates that lending is actually slowing, and quite sharply; approvals in q1 were down on the previous year, by 4%, and by 13.7% in March alone. We have noted before that the Central Bank’s latest modifications to their mortgage controls, which took effect this year, was an effective tightening, as only 20% of FTB loans can exceed the 3.5 LTI limit , as opposed to an actual 25% last year. Indeed, new mortgage lending was offset by redemptions and repayments in the three months to March. In other words net lending was negative and with new lending slowing and accounting for less than half the transactions in the market it is hard to argue that prices are being fuelled by credit. Rental yields in excess of 5% is obviously attracting buyers in a QE driven environment of zero short rates and 10 year bond yields of under 1%. Irish net mortgage lending falls again in Q1 and approvals also decline. In the autumn of last year the flow of new mortgage lending in Ireland started to offset repayments and redemptions for the first time since early 2010 and the annual rate of change turned (marginally) positive in January. Net bank lending to the non-financial corporate sector also began to pick up, although again the annual rate of growth was barely above zero, albeit adding to the view that the credit cycle was turning. The latest figures, to end-March, cast doubt on that however, as net mortgage lending rose in the month but contracted by €28m in the first quarter. This still left the annual growth rate in positive territory , albeit at an unchanged 0.2%, but the annual change in corporate lending turned down again, at -0.3%, following a €365m decline over the first three months. Consumer credit, boosted by car purchases, had been growing strongly but has also softened, declining for four straight months in cash terms reducing the annual rate of growth to 2.4% in March. New mortgage lending is still growing, of course, amounting to €1.7bn in Q1, with €1.4bn of that used for house purchase, but the pace of growth in the latter is slowing. particularly in terms of the number of mortgages drawn down. That figure was 6,400 in the first quarter, which represents a 9.6% increase on the previous year , compard to a 14.7% rise in the previous quarter and 26% growth a year earlier. The latter pace is clearly unsustainable and some easing was to be expected but the approvals data paints a more disconcerting picture; approvals for house purchase in March fell by an annual 13.6% bringing the annual decline in q1 to 4%. The shortage of houses for sale is no doubt impacting ( transactions fell marginally in the first two months of 2018 compared to a year earlier) while the Central Bank limits on lending may also be a factor, particularly the Loan to Income restriction which is particularly relevant for First Time Buyers. The average mortgage for house purchase rose by 22% in the three years to end-2017, against just a 4.4% rise in average pay, with house prices rising by 31% over the same period. There is clearly an affordability issue developing, exacerbated by the spending power of non-mortgage buyers, who see housing as an attractive asset class in a QE world of expensive equities and historically low government bond yields. The weak credit environment is also an ongoing issue for the Irish headquartered banks; total loans continue to fall, declining to under €176bn in March, a fresh cycle low, and exceeding deposits by some €8bn. The Central Bank has expressed some concern about the pace of new lending in recent months but the issue facing the economy and the banking sytem in terms of net credit is very different. Irish mortgage providers lent €6.4bn for house purchase in 2017, the strongest figure since 2008, with top-ups and re-mortgaging bringing the total to €7.3bn, a 29% increase on the previous year The final quarter was particularly strong, when adjusted for the usual seasonal effects , and we expect further growth in 2018, although affordability is deteriorating and the Central Bank’s modifications to its mortgage controls will no doubt have some impact on First Time Buyers , as Loan to Income is the main constraint for that segment of the market. Indeed, there was a notable slowdown in approvals in the last few months of the year, perhaps indicating that lenders are already adjusting to the rule changes. Drawdowns were very strong in the final quarter, nonetheless, with over 8,700 mortgages for house purchase including over 5,000 to FTB’s, some 60% of the total. For 2017 as a whole 29,400 mortgages for house purchase were drawn down, still a far cry from the boom figures in excess of 100,000 but significanttly above the low recorded in 2011 (11,000) and 18% above the total in 2016. The value of lending for house purchase implies an average mortgage of over €217,000, against €200,000 in 2016, and a cycle low of €174,000 five years ago. Interest rates on new loan have not materially changed over that period and household incomes have risen but the increase in mortgage size is such that affordability, the ability to service a mortgage, has deteriorated. Our own model compares the annual cost of a new , 25-year repayment mortgage to our estimate of gross borrower income, and shows that the ratio rose to 30% in 2017, the highest since 2009 and above the long run average (back to 1975) of 29.5. The ratio is still well below the heights recorded at the peak of the boom ( over 40%) but our forecast is for a further deterioration in 2018, to 31.2 , and this assumes no change in interst rates, so any rise in the latter would indicate a greater deterioration. At the moment a rate rise looks unlikely until 2019, at least, and the affordability change expected does not look material enough to have a significant impact on lending, given the prospect of further gains in employment, an acceleration in wage inflation and stronger house completions. Against that, the Central Bank’s changes to mortgage controls are undoubtedly a policy tightening, in our view, although not sufficient to prevent further growth in new lending, and we anticipate a figure around €9bn in 2018. Net lending has also started to grow in recent months, so the coming year will probably see the first rise in Irish mortgage debt in a decade. First Time buyers accounted for 11,896 transactions in the Irish housing market in the first eleven months of 2017, which is 1700 up on the same period in 2016 but still only around 20% of total turnover. The Government has sought to support that segment of demand via a tax rebate to help those seeking to buy or build a new home (the Help to Buy scheme) and has just announced a fresh initiative, this time in the form of State mortgage lending ( Rebuilding Ireland Home Loan) , although the scheme has a number of odd features and appears a strange step to take. To qualify, would-be borrowers have to have been rejected by at least two lenders, which immediately implies that the State would be taking on if not sub-prime then certainly higher risk loans. The lending decision will be taken by local authorities, so someone in those authorities will be making credit risk decisions, raising the issue of the criteria that will be used to decide which applicant is successful. Third, the State is driving a coach and horses through the Central Bank’s mortgage controls and one wonders what the Bank makes of it and whether it was consulted. Lending institutions are required to limit mortgage loans to a maximum of 3.5 times the borrowers income , with 20% of lending to FTB’s per annum allowed above that. The specific limit for FTB’s has just been introduced and represents a de facto tightening of standards, as 24% of lending to that segment exceeded the limit in the first half of 2017. Yet the State scheme allows a LTI range from 3.8 to 5.0, which is much higher leverage than deemed acceptable to private lenders, and therefore higher risk. The scheme does have a loan to value limit ( 90%) and a maximum property price, so putting a cap on a given loan, although it does differentiate by location; properties in the major cities and in the counties surrounding Dublin carry a maximum loan of €288,000 as against €225,000 elsewhere. Over 60% of transactions are in the former areas so the €200m allocated implies that less than 800 loans could be granted in 2018. Total mortgage lending for house purchase this year is likely to be around €8.5bn so the scheme is not material in terms of the overall market. Finally, we have the issue of funding costs. Successful borrowers will have three options, two fixed rates and one floating, all well below current market rates. For example, a 25-year mortgage would cost 2% fixed, and a fixed rate for that term is not available from Irish banks- in general, banks can’t borrow at that maturity, so 3-5 year fixed is the most common (although some 10-year is now available). The State can and has borrowed for 25 years and longer, with a bond maturing in 2045 trading at around 1.8%, implying a very small margin if that was tapped to fund this initiative. Successful borrowers will be getting a cheap loan with the State taking on a level of risk that the private sector is unwilling to bear, at least at that cost, and indeed what the Central Bank is also unwilling for borrowers or lenders to countenance. Posted on January 23, 2018 Categories Property marketsTags Central bank mortgage controls., Irish mortgage lending, Loan to Income limit, Rebuilding Ireland Home loan.